Search for the best flight prices from Manchester to Zadar. Compare prices, book today and save money with Manchester Airport. 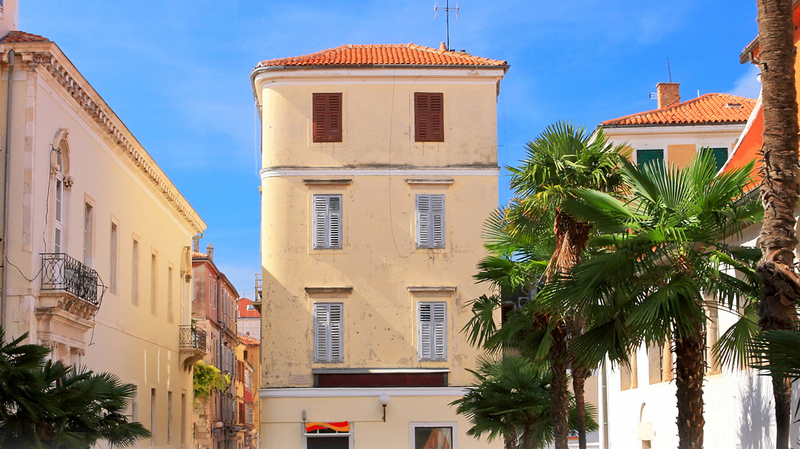 Bang in the middle of the Dalmatian coastline in central Croatia, modern day Zadar, with its restored historic centre, Roman remains and ancient churches, is a hidden gem. Go for the coastline. Go for the laid-back cafe culture. Go for endless boating around its archipelago of Adriatic islands. But most importantly, just go. Right in the Dalmatian coast, this walled town is a vision of red-roof and white-stone architecture that glints beguilingly in the sunshine. For classy contemporary design, you can't go wrong with Art Hotel Kalelarga (Majke Margarite 3) where the rooms ooze hip, up-to-the-minute style. If you're looking for mid-range hotels, the best district to search is away from the shore, between Dikla Street and Nina Street. Apartmani Petra (Roberta Frangeša Mihanovića 63) is a peaceful, homely choice, while Villa Diana Zadar (Bokanjca 15) features plenty of top-class touches without the hefty price tag. Handmade lace, woven textiles and traditional sheepskin products such as slippers and hats are worthwhile souvenirs of Zadar. The Old Town's antiques market (Jurja Barakovića) is a treasure hunting vortex if you want to search out some bargains. For more modern local products, head to Studio Lik (Don Ive Prodana 7) where you can purchase the famed Pag Island lace as well as plenty of other textiles. Those looking for local art shouldn't miss the gorgeous jewellery and artwork at Val (Ivana Mažuranića 20). Dalmatian cuisine is a blend of cultural influences that utilises the seasonally fresh flavours and plentiful seafood of the Adriatic. For romantic harbourside eating, Foša (Kralja Dmitra Zvonimira 2) is a top choice. For well-priced seafood, try family-run Hotel Niko (Obala Kneza Domagoja 9), or the simple but tasty dishes at Stomorica (Stomorica 12). The Garden Bar (Liburnska Obala 6) is the see-and-be-seen stylish choice for an evening of cocktails and fun, while Arsenal (Trg Tri Bunara 1) does excellent coffee during the day and becomes a funky, chilled-out lounge bar once the sun has set. Taking place across a range of venues inside the city, this month-long event presents a series of theatre and dance performances from both Croatian and international drama groups. Run by the owners of The Garden Bar in downtown Zadar, this boutique music festival attracts a host of big-name DJs and live music acts from across the dance music genre. It takes place just outside of town, on the beach in the little village of Petrčane, and fans come from across Europe to dance the weekend away. This annual one-night-only event is dedicated to Croatian culture and happens on the midsummer full moon. Residents switch off their lights and gather along the Riva River which is illuminated by candlelight. Boats sell traditional Croatian food, and music and folk dancing goes on long into the night. St Donat Church is the main venue for this long-running festival of medieval, Renaissance and baroque music. Celebrating the scrumptious fig in all its culinary uses, this festival hosts a programme of food markets in the centre of town, selling – of course – fig products, as well as cooking demonstrations and fig-based food-tasting events.